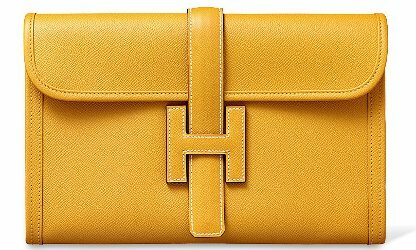 In a review of Hermès 24, Faubourg, I compared it to the company’s Constance bag.1 While sampling Parfum d’Hermès, I couldn’t help but think of a mild-mannered cousin to 24, Faubourg. So, let me play the game one more time and pair Parfum d’Hermès with the Jige bag. To me, the Jige, a clutch, is a less formal, less sharply featured version of the Constance shoulderbag. So Parfum d’Hermès is to 24, Faubourg. Perfumers Akiko Kamei and Raymond Chaillan developed Parfum d’Hermès. Its notes include aldehydes, bergamot, hyacinth, Egyptian jasmine, Florentine iris, ylang ylang, Bulgarian rose, labdanum, cedarwood, musk, amber, spices and vanilla. I’d add orange blossom to that list. Parfum d’Hermès was released in 1984. It shows a little of the era’s swagger in its top notes, but it calms into a sweet, proper perfume almost right away. 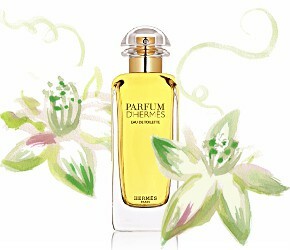 Parfum d’Hermès kicks off with a signature of juicy hyacinth and sharp galbanum. Before you start thinking of Guerlain Chamade, a wave of clean orange blossom and sugar washes in. The sugar isn’t the caramelized shimmer of amber, but is like sniffing straight powdered sugar. As the fragrance relaxes, the sugar becomes creamier with ylang ylang and picks up a hint of vanilla. Its iris, fruity and candied, blends seamlessly with the rest of the composition. Now Parfum d’Hermès smells like hyancinth jam sprinkled with rose petals, with a vanilla pod stuck in the jar. After Parfum d’Hermès’s dramatic first fifteen minutes, it retreats to a sweet, clean, vaguely powdery fragrance that settles nicely into my personal zone. My acupuncturist, a keen nose2 and a good sport about putting up with my fragrance trials during our sessions, pronounced Parfum d’Hermès “sweet and ladylike.” If not for the perfume’s assertive opening, I could see it being perfect for a shy 14-year-old who spends more time online poring over Queen Victoria’s journals than on Snapchat. When I realized that Parfum d’Hermès reminded me of 24, Faubourg, I tried them side by side. Whoa. Next to 24, Faubourg, Parfum d’Hermès smells nearly featureless. Sure, they’re both rich, high-toned florals with a dose of orange blossom, but 24, Faubourg is noisy. Sometimes that’s wonderful — the perfume has a lot to say, and it’s interesting and beautiful. But sometimes you just want your perfume to shut up so you can read. Over the past few years, Parfum d’Hermès has become hard to find. The Hermès website still lists Parfum d’Hermès Eau de Toilette (see image above) in one of the tall bottles it now uses for many of its classic fragrances, like Equipage, but it doesn’t list a price for the U.S. store. This might be one you have to buy in France, find as old stock in a perfume boutique, or seek out online. 1. I took a wild stab at pairing other Hermès fragrances and bags, too. Not that I’ve ever seen any of these purses in real life. 2. For instance, she doesn’t wear fragrance and seems to limit her makeup to chapstick, but she loves vintage Miss Dior. I’ll have to ask for Parfum d’ Hermes the next time I’m in a boutique (state-side as a trip to Paris is not in my immediate future). I came thisclose to buying a Constance but it came while I was on vacation and since I was not (and still not) an Hermes connoisseur, the bag was not held for me – boo hiss! Parfum d’Hermes is often overlooked, and although maybe it’s not the star of the line, it’s worth smelling, I think. So close to having a Constance bag, but denied! I feel your pain. It sounds like the newer version has REALLY been changed (it probably doesn’t help that it was reinvented as Rouge Hermes before being relaunched in a revised formula under its old name). The 1984 vintage parfum has a lot of galbanum and rose, but it’s also thick with warm, resinous incense, with benzoin and a dose of oakmoss for good measure. It’s opulent and overfull in that kitchen-sink eighties way, the exact opposite of featureless. Interesting! I didn’t get moss or incense from my sample. Instead, it smelled like a standard floral oriental. I would have loved to smell the parfum and older versions, too. I’ve always wondered about this, but I’m always reluctant to test the current version of a classic perfume that must have changed greatly. It’s interesting to read about it. I would definitely want that bag if I wore tailored suits or dresses. Someday I want to get my hands on an Hermes bag simply to examine the craftsmanship! I’ve never tried or even seen this one, and from what Pyramus says, it sounds like Hermes has been indecisive about the formula and presentation. That’s the sort of thing I expect from Guerlain and Dior, but not Hermes. Isn’t it amazing how a fragrance can be spoiled by the person who wears it? Just like music can be spoiled if it’s listened to at the wrong time. That said, I think 24, Faubourg could absolutely be worn with wit. It’s so baroque and nouveau riche (but lovely!) that it might play well, if worn discreetly, with a ponytail and chambray shirt. No way, I wore this to bed last night! ???? I’d been rummaging through my sample stash looking for… what was it that I was looking for? Anyway, spotted a lovely carded sample and thought I’d give it a go. Very nice but too much sweet powder for my taste and, while I’m not one to gender-specify fragrance, this one definitely belongs on the women’s shelf. Kismet! What are the odds? Yes, this one is pretty much the ne plus ultra of girly perfumes. Hi Angela, great review as usual. My mother wore the vintage version. It came in the leather canister refillable sprayer. I remember it being soapy to my untrained nose back then. Have you heard of Rouge D’Hermes? It is thought that the brand realized that naming a fragrance “perfume D’Hermes” was a bit clumsy. So they reformulated Parfum a little bit and called it Rouge at the end of the 90s. Would be nice to get your take on Rouge after your excellent review of Parfum. As usual I always look forward to all your articles on NST Angela! PS: the craftsmanship of Hermes leather is so god that no not a single stitch can vary in size and the brand shreds any piece of leather that is not deemed as perfect in the atelier before releasing it. That’s why you never find and Hermes at discounter or at outlets. I think I’m going to have to review Rouge very soon! Thanks for the recommendation. I love beautiful craftsmanship, and so many so called luxury brands don’t provide it these days. I know Hermes is one of the few hold-outs. I’m so skeptical, though….but I’m willing to give the brand a try, if I get the chance! In the meantime, I’ll satisfy my urge for luxury with beautiful 1950s Mexican hand-tooled leather clutches. I’d love one of those Mexican tooled-leather clutches even more than a Jige, though I wouldn’t mind having both. I wonder whether Santa Claus reads NST? There are so many gorgeous tooled leather bags out there, and they go for a pittance. Listen up, Santa! Was too eager to send from my iPad on a slow internet evening! “The craftsmanship of Hermes leather is so *god* ” works for me. Thanks! Was a pure slip of the tongue (or fingers) but oh so spot on ???? Typing on an iPad is tough! In any case, I understood. One thing I can assure you of, Mon Angel, The original was Much more Multifaceted and the Galbanum was uplifted and supported by a THICK swirl of Oakmoss and a bare touch of Civet, if my nose didn’t lead me wrong… and also, it was far more Osmanthus forward… there was a clear strain of Apricot/Honeyed-ness that sparkled through with the other floral notes… if it doesn’t have osmanthus in it… It’s not the same beauty it used to be! You know, the first few times I wore it, I did get a fleeting hit of civet–I bet it comes out more in other forms. I didn’t get much in the way of osmanthus, though. Too bad! I love your enthusiasm for the fragrances you adore!